A Kent weekly was the first newspaper in the country to print the results of a by-election on its patch this morning. The 16-page special covering UKIP’s victory in the Rochester and Strood by-election was given away free to readers who bought the main edition of the Medway Messenger, which goes to press on Thursday lunchtime. A team of reporters was on duty covering the results for the Messenger’s parent KM Group’s KentOnline website through the night, but editor Bob Bounds was determined print readers would not be short-changed. Plans were put in place for an early-hours production desk operation, which saw the paper go off-stone at 7am and arrive in shops later this morning. 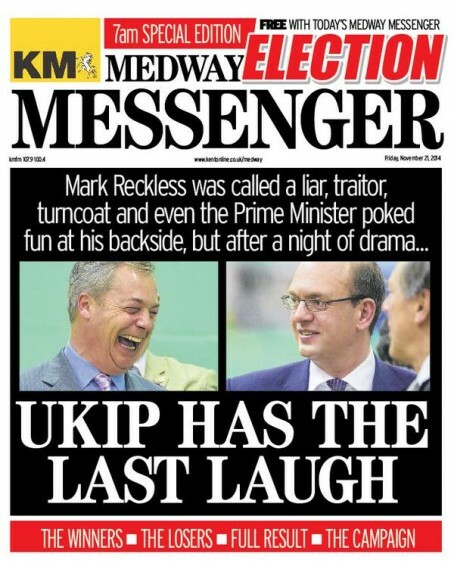 The election was won by UKIP candidate Mark Reckless, whose resignation as the sitting Tory MP triggered the ballot. KM Group editorial director Ian Carter said: “We had comprehensive online coverage, updated throughout the night, and the easy option would have been to accept the result was too late for our print edition and direct people to the website instead. “However, our print readers are our most loyal customers and it’s right to provide them with the best service we can. Great effort, and it would have been so easy to go for the web option alone. After all that hard work there is nothing like seeing your readers actually holding a copy of a special edition like this. A great effort and one few regional newspapers could have emulated. Well done Bob and team.